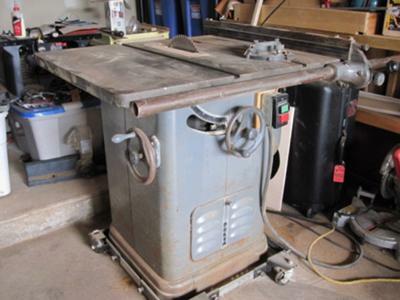 Delta 10" Table Saw, RH tilt - Like this one. The picture above is from the post by Todd Holland on this web site. Our saw looks just like this one. The saw is pretty old but does not show any rust. It is a cabinet saw. The top and wings are cast iron and the cabinet is painted a light, grayish blue. The removable panel on the front is vented and says DELTA on it vertically, in an art-deco style. It does not have any plaque indicating a model number or a serial number of the saw. The motor has a plaque on the end seeming to indicate 1 HP, voltage, etc but is very worn and hardly readable. This plate has red paint and the numbers are stamped into it. The switch (on/off) plate is original and indicates Delta and made in USA in Milwaukee. The arbor nut and blade washer are missing, otherwise it is in perfect working order. I am trying to locate a new arbor nut and washer but do not know if they are all standard thread or if I need a special nut. Any and all help locating the serial number or model number is appreciated. Ultimately I need to locate a source for a new nut and washer. Any help provided is appreciated. Thank you.